Good to know: This is Garvey's first book for teens. It is a standalone, and not the first book in a series. Cold Kiss can be described as a cross between Pet Sematary and Shiver. Garvey writes about something most of us can relate too; how it feels like to loose someone we love. I know that I have thought many times that I wish I could spend some more time with loved ones that have passed. Wren acts out on this longing, she brings the love of her life back from the dead. But soon Wren realise that it is not safe to mess with nature. I am the kid who sticks her finger in the light socket. I am the person who doesn't check the expiration date on the milk. I am the idiot who has never looked before she leaped. I am the girl who is falling apart, right now. Cold Kiss also deal with darker issues; the love Wren feels for Danny turns to a form of obsession after he dies. She wants to be with him no matter what. She does not reflect upon how it must be for Danny to be brought back to life, a life where he is hidden from everyone he once knew, aside from Wren. Danny exists only for Wren, it is all about her feelings. I wrote that the book is a cross between Pet Sematary and Shiver. As with Pet Sematary, Cold Kiss is also about what happens when you bring someone back from the dead, and the person brought back is not the same person you knew before. When I mention Shiver, it is because Garvey has a writing pretty similar to that of Maggie Stiefvater. She has some beautiful quotes and passages. I liked some parts of the story, and the fact that the book is seeping with emotion. But I thought the story was too slow paced, nothing really happens until the second half of the book. The first half is all about how Wren regrets bringing Danny back, and it is not intereresting to read only about that from chapter to chapter. But when Wren talks more with Gabriel, things really kick off. It wasn't love right away, because nothing ever is, no matter what the songs say, but it was the start of it. A beginning in one way, and the end in another. I think that might always be true of love. I love that some authors still writes paranormal novels that are not part of a series, that in itself is a good reason to read this book. I have not read a lot about zombies before either, and that was also refreshing. 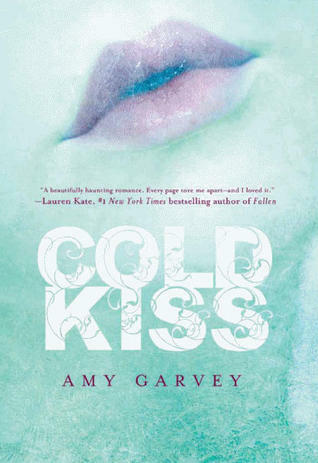 Cold kiss is a beautiful written book that will appeal to those who like a slowpaced book that grips you. Amy Garvey is on Goodreads and has her own website here.